2006. Tor. Hardcover. 319 pages. 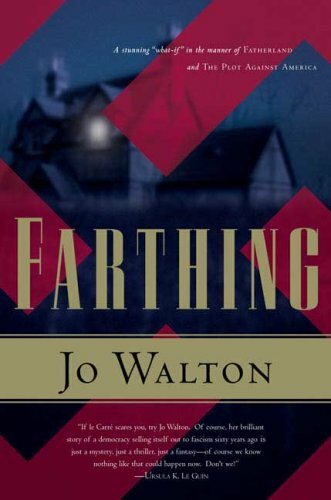 In the alternate universe of the Small Change trilogy, of which Farthing is the first book, England made peace with Hitler, and continental Europe remains under German rule. The Farthing set, a group of political insiders who orchestrated the peace agreement, gathers at the Eversley country estate. The invited guests include Lucy and David Kahn. Lucy is the daughter of the Eversley’s and her husband is Jewish. When one of the Farthing set is murdered, it soon becomes clear to Lucy and the London inspector Carmichael, that David Kahn is being set up to take the fall for the crime. The book switches between Lucy’s first-person perspective, and Carmichael’s third-person perspective to reveal the machinations and intrigue that are behind the murder. I appreciated having both Lucy and Carmichael’s viewpoints in the book. I especially admired how Walton never allows either Lucy or Carmichael to have the whole picture. For instance, Carmichael learns early on the true time and cause of death of the dead man, but even to the end of the book, Lucy still only knows about the first assumed cause of death – that the man died of a stab wound. And Lucy knows the true nature of the guests’ interpersonal relationships, the details of which never are fully revealed to Carmichael. It’s refreshing to have a mystery where the characters don’t come across as a little too omniscient. Both Lucy and Carmichael are intelligent and even prescient at times, but they are still limited in understandable, human ways. I don’t feel compelled to rush out and read the second two books of the trilogy though I do plan on getting around to them. Apparently one of them is a shout-out to the Mitfords, of whom I have only passing knowledge. I kind of feel like I want to read a book by or about the Mitfords before reading that Small Change book. I know it’s not necessary, but I think it might add to my enjoyment. 2012. Harper Collins. Hardcover. 254 pages. From: I bought this book. The ideas of blackness that make it into mainstream thought exclude too much of the full range of who black people are. Whether it’s musical taste, dancing proficiency, occupation, or intellectual interest, all nuance is ignored for a simpler, often more sellable blackness. In this book, I will attempt to re-complicate blackness, exposing the challenges, the fun, and the future of being black in the United States. It’s also a convenient way to make you care about my life story. 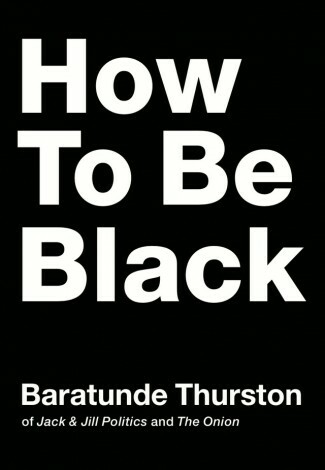 I read How to Be Black about a month ago. I first heard of it via Buried in Print’s review of the book, and then I went to HarperCollins’ browse inside feature and read the introduction. I read it aloud to my roommate and we both thoroughly enjoyed Thurston’s snarkiness and pointedness. I decided I wanted to read the rest and soon, so I ordered it. I finished it not long after it arrived, because it’s a pretty fast and interesting read. At the time of this book’s writing, Herman Cain was a Republican presidential candidate. He is a black man best known for having been the CEO of Godfather’s Pizza. I feel quite confident that by the time you read this book, his campaign will only exist in the past tense. If I’m wrong, then it means the country has fallen into ruin more quickly than I could ever have imagined, and there are probably roving bands of feral, armed children dominating the streets, which begs the question, what are you doing reading this book? You should probably be foraging for scrap metal and hoarding ammunition. I also liked the memoir bits of the book – about Thurston’s mom and all the experiences she wanted her children to have; about Thurston’s experiences at Sidwell Friends and Harvard. Are you keeping up? We’ve got experimental blackness abounding at this point, but how do we make it stick? How do we replace the overwhelming media images of limited blackness with a more expansive concept? It’s already happening. You’ve got the Afro-Punk movement and Black Geeks and the black people who love nature, and more . . . I haven’t got around to checking out Thurston’s other work such as the Jack & Jill Politics blog, but I hope to. Anyway, if I have managed to spark your interest at all in what feels to me a somewhat haphazard review, I would add that this is a book that would be best read soon. Thurston’s references can sometimes be very of-the-moment (see quote about Herman Cain above), so get them while they are fresh. 2009. Twelve. Hardcover. 417 pages. Dave Cullen was a journalist who reported on Columbine at the time of the school shooting tragedy. In this book, published ten years after the event, he describes what happened before, during and after that day. Many things reported as true in 1999 have been proven to be myths or have had important omissions. The book starts off with a straightforward description of what happened at Columbine High School on April 20th, 1999, from the perspective of students, teachers, police and parents. The rest of the book is composed of chapters that alternate between a picture of the community in the aftermath and an analysis of the lives and motivations of Dylan Klebold and Eric Harris. But for all that I was glued to the Columbine news at the time, reading this book made me realize how little I knew about it, how little the news reporters knew, in fact, when they reported on it at the time. I think that it was a good structural decision for Cullen to tell the story of that day right away. It would seem pointless, even slightly wrong, if he were to construct the book in straight chronological order. It shouldn’t seem like it’s trying to be a suspense story. This is a book about trying to make sense out of the senseless acts, and about setting facts straight. I was more interested in the aftermath sections than in the sections discussing Klebold and Harris. The story of the aftermath is a sad story, of course, not only for the hurt inflicted upon all the kids, and the parents and the community, but also for the way that differing responses to the tragedy clashed against each other and created new wounds. The story of the minister who reached out to the Klebold family stands out in my mind from this section. I liked that Cullen explained how and even why the news media messed up, causing certain myths to take a permanent hold in national memory. I find it somewhat disturbing that some still hold onto the myth of high school student Cassie Bernall’s last moments even when confronted with the truth. The sections that analyzed Harris and Klebold were good, even if I wasn’t interested in all the details that are included in the book. One of the strongest parts was when Cullen explained exactly what a psychopath is, and how that makes dealing with one especially difficult. Also, I had not even heard about how the mother of one of Harris’ former friends had called the cops regarding Harris starting in 1997. A huge source of information for the psychological analysis included in Columbine, was from the work of (now retired) FBI agent Dwayne Fuselier. Fuselier’s son was a student at Columbine, and Fuselier had experience as a hostage negotiator and psychologist working for the FBI. With his automatic closeness to and expertise for the case, Fuselier ended up researching and completing an assessment on the two students who killed their classmates. But as Cullen reminds the reader, there are some things that are still not known. Testimony from Harris and Klebold’s parents has been sealed until a date far in the future. 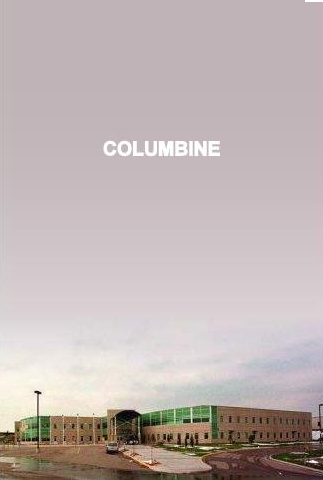 Still, what is provided in Columbine is a clearer picture than what I had before. Columbine is definitely a book I felt compelled to discuss with others. I said to my roommate that it makes me want to read other books like this one – books written years after a major news event, thus (hopefully) having the extra clarity and coherence that only the passage of time can provide. Not that long ago, there was a fatal shooting at Chardon High School in Ohio. I saw speculation as to motive and means play out and change in successive news stories. In time, maybe the fuller story will be known. Unlike what happened at Columbine, the shooter in this recent tragedy did not die. But I definitely thought of Cullen’s book when I read about the shooting at Chardon and I did feel like I had a more grounded perspective towards it because of this book. Eva of A Striped Armchair has started a lovely feature where she recommends books to readers who email her a list of her favorites. I had emailed her soon after she announced this, and today she posted her recommendations to her blog! Unfortunately, I have discovered today that my comments are not showing up on other WordPress blogs, so my expression of joy on her blog has been frustratingly thwarted from public appearance. So I’m just throwing up this little post to say thanks! I’ve only read two of the recommendations (Purple Hibiscus and Their Eyes Were Watching God) so there’s a bunch of books that I’ve now added to my to-read list now! It’s possible that I may love music more than I love books. (But of course I wouldn’t do without either if I could help it.) However, I rarely write about music because I feel that I don’t have the terminology or breadth of knowledge to discuss it in a way that people would understand. Musical genres and subgenres confuse me and seem to be more important to music reviews than genres are important to book reviews. Also, my musical knowledge has significant gaps. I couldn’t tell you who influenced who or what other bands share the same territory as this one band. But I do love to share music with others, and the best way I can find is just to have them listen to it. So, with that said, here are two bands I’ve been enjoying lately. The first is a band called Tennis. I’ve only heard the songs from their new album Young & Old. And the other band is The Silver Seas. The album I own is called Chateau Revenge! which is just a cool title. Both bands have a retro vibe, especially The Silver Seas.